I use the title 'Listening to Lee Child' for effect only. His voice is a hybrid of United States/United Kingdom - English that is easy on the ear, but is marbled with surreal observations that stop you in your tracks and force you to think for a minute or so on some profound metaphor he conjures up. Lee's serial character, Jack Reacher, does the same, but prefers the steel grip of a Glock 19 because, unlike his creator, he is a man of few words, most of which are usually lost against the splatter of bullet casings. Lee likes to examine why things are the way that they are. On his current tour, he has been asking why do all watches/clocks in magazine adverts tell the same time - ten past ten? He researched this factoid and reveals to the audience the answer with all the glee of a carnival barker pulling back a tattered curtain. The reason for the ten-past-ten frozen time zone is that, that configuration most resembles a 'smile', and the marketing folk want to lull us with the self-same smile. Lee Child resembles that watch as he introduces us with glee to his America, as seen thorough the eyes of Jack Reacher. I discovered Lee's books a few years ago, after he was awarded the Anthony for 'Killing Floor', his debut novel set against the backdrop of Small Town America caught at war with a surreal and brutal conspiracy. The book is peppered with strange observations and the perceptive insight that only an outsider can truly reveal. Lee, like his character Jack Reacher, is just that - an outsider looking within and revealing wounds that perhaps the 'insiders' fail to see or do not want to see. Everybody sees Reacher differently, but once you strip him to his core, you will find that he really is a very simple and decent man. He is a man who lives by his own code, a man who has no quirks except the ability to sort out problems using his mind as well as his body. I found it amusing that a particular Latin phrase 'E Unum Pluribus' which, roughly translated, means 'Out of one comes many' is used to great effect in the novel's structure. My initial amusement came from my childhood recollection of Stan Lee's catch-phrase for Marvel Comics 'E Pluribus Unum' which translated means 'One of many' which I thought curiously apt as a contrast to Lee's work. Jack Reacher is far, far from the stereotypes and conventions of the comic-book hero. Reacher is a hero, but one that lives at the edge of convention, and Lee keeps him just on that edge. Writing about heroes is risky. Lee takes risk in his stride. What could have ended up as disposable pulp, is now heralded as one of the most fashionable crime series around today. It appeals on many levels, but then again so does crime. I have often discussed my own love of Alistair MacLean's earlier works with Lee, especially the stories that the Scottish/American writer told before his move from Switzerland to California; before his addiction to alcohol dominated his life so much so, that the stories after 'Circus' began to unravel. This revealed a reliance on formulaic plots and less on the edgy heroes he once so skilfully carved. 'Men on a Mission' is what Quentin Tarantino referred to in his précis of the MacLean formula. I can report with relief that no such issues cloud Lee's work. In fact, he has chiselled many diverse novels from the violent, chase thriller 'Die Trying', through the classical mystery of 'Tripwire' to the surreal, serial-killer mystery 'The Visitor' and then back to the Neo-western roots found in his debut, 'Killing Floor' with the blistering 'Echo Burning'. 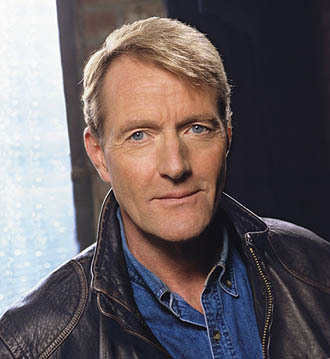 In some respects, Lee Child is more akin to Ian Fleming, another British writer who wrote as an outsider from his beloved 'Goldeneye' retreat, setting the action in alien contrast to the 'safe' British backdrop of his home. The vista for Jack Reacher now becomes broadened with a panoramic grassy knoll conspiracy mystery 'Without Fail'. Each novel is like a 'stand-alone' adventure pitting Reacher against the alien terrain that is his country of birth, but not that of his creator, and for that reason, the stories become hugely enriched. This enrichment is akin to Patricia Highsmith's love of Europe and all its contradictions and amorality that played well with her deliciously warped Tom Ripley. European amorality even seduced Thomas Harris out of 'retirement' to wander to Florence for Hannibal Lecter's return to his true home. The contrast is that Jack Reacher has to survive the amorality that swirls wherever he travels. There is something mysterious about crossing the Atlantic Ocean that seems to bring out the unusual in accomplished crime writers, and Lee Child is secure in that company. I would love to recall the vignettes Lee peppers on his tour- the funny stories, the generous way he talks about his writing contemporaries (especially all the folk that surround him on the shelf marked 'C' - writers such as Crais, Connelly, Connolly, Cornwell, Coben, to name only a few) or his pushing of less well known writers such as the talented Brian Wiprud. I could even talk at length about the patience he has with his hugely diverse audience, but I was asked to interview him so I hope you enjoy the interview as much as I did. If you get a chance - see Lee Child speak as he promotes 'Without Fail', if not, read his books and discover Jack Reacher. When you do, check the time - I'm sure your watch will read ten-past-ten. When was Reacher formed in your mind? Was it in a moment or over a long period of time? It was over a longish time actually. Probably a ten year process to be frank, between first of all thinking that I want to write and then thinking I could write and then thinking Okay, what to write? It was a slow process that he emerged but then as soon as he was fully formed in my mind, he was the key to everything else. Because it's the character that comes first. It's really, really important or else you get nowhere at all without a strong central character. When did you first hear that you'd been nominated for the Anthony for 'Killing Floor'? That was funny actually because I was so preoccupied at the time. That was the summer that we moved from England to the States, so it was a very busy summer anyway. I was very new to the writing scene; I had no idea that there were prizes. I had no idea whether or not it would be important or anything like that. My editor at Putnam called me. I didn't really know what it would mean at that point and so I said, 'That's great!' and he said, 'Are you going to go to Bouchercon?' I said, 'No I don't think so.' He said, 'You really should go if you've been nominated.' So I began to twig that maybe this was a bigger deal than I thought initially, so I went to Bouchercon and won the prize ...and it was amazing. You also won the WH Smith's Thumping Good Read for 'Die Trying'. How did that come about? Did the publishers push for it, or was it just nominated? Publishers have got to advance a number of books for consideration for the shortlist so there is an element of pre-selection by the publishers. So they included 'Die Trying' in their entry but, after that, it's in the lap of the gods and it was up to a – I think - a Smith's panel who decided a shortlist and then, as you know, the actual prize is judged by real readers. They just pick out Smith's customers, actual people in the street really, and they do the judging which is why it's the prize that I'm possibly most proud of because it is chosen, literally, by the readers at which I'm aiming. There's no element of insider information, no professionalism, no preconceptions at all in the judging process, they were just normal people. Therefore, that prize meant a lot. It was in the third Reacher novel that I realised that you didn't use excessive bad language, but considering the intensity of the plot, it's remarkable that I didn't twig until then. How did that come about? Well, it came about because although personally I use and always have used profanity in my speech, for some very subconscious reason, I just could not write it down on the page. I really couldn't and I also then realised that it's impossible to capture speech realistically unless you are prepared to fill up the page with four letter words - which is actually how highly stressed people speak. So I thought were into artifice here anyway, so let’s go the whole hog and make highly stressed, tough-guy speech with no four-letter words and see if it's possible and I think it comes across as convincing. There are a certain number of people who are grateful that there are no four-letter words, and I have never heard from anybody who misses them and wishes I'd put them in. Well it's remarkable anyway. One element I wanted to ask you - 'Killing Floor' was in the first person and you got into the mind of Reacher and the back-story to begin with. Have you thought of returning to that format? Yes I have and, in fact, I have returned to it for the 2003 book, 'Persuader' which is out in the UK in April 2003. It's in the first person again from Reacher's lone point of view. Have you ever thought about writing in the third person from a different character's perspective, say like Ian Fleming did with 'The Spy Who Loved Me’? Is Jodie coming back? Is Harper coming back? Is Nagley coming back from 'Without Fail?' Generally I don't like to bring people back because I try and avoid the soap opera aspect because other people do it so well - I think I'm going to be different. It's certainly tempting and I did have an idea that maybe I could tell a story from, let's say, Jodie's point of view or Nagley's point of view in the first person with Reacher himself appearing as a supporting character. That might be really nice, a new perspective on him. Excellent idea. One distinctive feature of the UK editions is the marketing strategy. Two questions really. Firstly do you get involved at all in the marketing of the books, apart from book tours or on the actually packaging or the covers? Well what I've said to the publishers in terms of marketing - I will do anything anywhere, any time to support their efforts. But equally I've been in the media a long, long time - 25 years now, media of different sorts and I'm very comfortable with the idea of horses for courses. Put it this way I'd be very pissed off if the Marketing Director started writing my books for me, so I'm certainly not going to start planning his campaigns for him. On that question - the silhouetted figure that says "A Jack Reacher Novel" on your UK covers - is that anyone we know? It's someone that a lot of people know. His name is Jonathan Newell who is the Managing Editor of Bookseller magazine, and he is a fan of the series. The photographer thought in that pose he would look convincing, and he agreed to do it. The other thing is there seems to be, particularly in 'Killing Floor' and 'Echo Burning', a real Neo-Western feel about it. You know - the stranger rides into town, sorts out the problems and then disappears again. Did you consciously put that in? Entirely unconsciously. I mean I totally agree with you - in retrospect they are classic Westerns structures, especially 'Killing Floor'. Although it's thoroughly contemporary, set in the present day, it is fundamentally a western. I'm not an expert on westerns. I don't know much about them. I haven't watched many of them. I think it must be a subliminal influence from childhood when you know there was Rawhide, Gunsmoke, Lone Ranger - all those things I watched as a kid. Both you and Dennis Lehane have cited Alistair MacLean as early influences. Could you elaborate a little bit about the Alistair MacLean sort of ethos and where your Jack Reacher character comes in? The thing that really strikes me when you analyse Alistair MacLean is the way he writes heroes, which are full blooded 100% heroes, that are teetering awfully close to 'over the top' parodies, but never, ever falling over the edge. I liked that as a reader and I think that's what I try and do with Reacher - make him an unequivocal hero. You can call him an anti - hero but he really isn't, he's a perfect hero and I try and keep him this side of parody in the way that Alistair MacLean did. 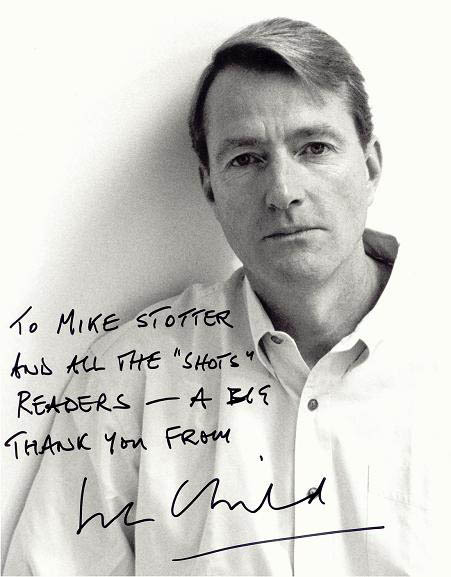 Maggie Griffin, your website administrator, does a great job on Leechild.com. How much involvement did you have when the web-site was set up? Well again like I said before in answer to an earlier question, I'm totally comfortable with the idea of finding an expert and letting them get on with it uninterrupted. My only involvement really was to say 'Maggie, do me a website' and she did. It's quite fun (Leechild.com) because you post on the forum every couple of weeks and there's a big die-hard fan element. How do you find coping with the e-mails people will be sending you and catching up, as well as writing full-time? All the e-mail goes through Maggie and she filters out the abusive or the dodgy ones and then forwards everything else on to me. It is getting just to the point now where it is becoming overwhelming. The volume of e-mail is such that I am going to have to make some sort of policy decision about it. If someone writes to me, I really feel they need a personal reply and I would feel very bad if I didn't give them one, but it's getting to the point where the volume is that I would just be doing it all day and not writing. If you could select six books form your TBR (To Be Read) pile for a desert island holiday, are there any books that you really want to read? In my TBR. It's a difficult question to answer, because until you've read them you don't know if they are going to be any good. I've got George Pelecanos's 'Hell to Pay' - that's next in my TBR pile, beyond that, I only look one book ahead at a time. I'm sure the Pelecanos book will be good. Do you have any writing rituals? Say at the start of the day? Close of the day? Re-writing? I have a lot of rituals, which are all completely bizarre. The main one is that I hate a chapter that runs two lines onto the next page. I'll edit it until it fits onto the full previous page. Same with paragraphs. I hate a paragraph that runs one word into a line. I'll edit it so it makes up a full line, which is stupid, of course because once it's set into type, it bears no relation to my layout - It might well look bad again! But writing is full of rituals and little superstitions, and I'm a victim of most of them, I think. An obvious question, but which writers really influenced you in the past? Alistair MacLean, as we've talked about, I think probably John D MacDonald, Robert B. Parker. I would say all those guys influenced me in a positive way. There are some writers that influence you in a negative way, when you see either that they are doing something so superbly well, you’re gonna stay away from it because you can't compete, or that they are doing something that annoys you, and it crystallises something that you need to avoid. So, potentially, everybody's an influence. We've also heard that you're quite a big fan of Michael Connelly's books. Yes I am a fan of Michael as a 'Writer' in both senses of the word. I love the product, but I also love the process that he exemplifies - no fuss, no drama - just a great book every year. In many ways, that's ninety percent of the game. We heard a rumour that Dennis Lehane's brother prefers the 'Jack Reacher' novels to the 'Patrick and Angie' novels - is this true? Dennis told me that himself, so I'm assuming it's true. It's one of two bones of contention I have with him, the other being that he's a Red Sox fan, and I'm a Yankee's fan. The last point is to thank you for your time. We've never seen a 'Jack Reacher' novel in a remainder bin, and long may that last.